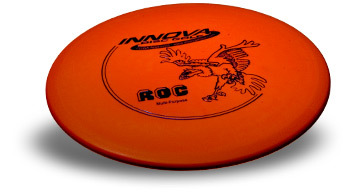 Great for beginners, and great for experts, the Roc is my absolute favorite disc. If it were the only disc I had, I�d still be a happy golfer. It�s slightly overstable, but can be thrown pretty straight and far when needed. I�ve used the Roc as a distance driver with good results, but the Roc�s pride is in the midrange and approach. It responds perfectly to movements in the wrist and goes precisely where you want it. It�s great for getting around trees and other obstacles in beautiful hyzers and anhyzers (arches); it even rolls pretty good when in a tight spot. Sometimes it may roll too well on a longer shot and roll away from the hole, but that can be compensated for by shooting a little left or throwing more flat and straight. It fades faster than most and tends to curve right for right-backhanders, and curves left, and then roll right, for right-forehanders. I give this disc an A+ and �Best of Breed� in its category.